The 8th annual Elf Classic Yacht Race has a new race course and date, with the rescheduled race now taking place on the Miles River in St. Michaels, Md. on Saturday, September 29, 2018. The annual race is sponsored by the Classic Yacht Restoration Guild and the Chesapeake Bay Maritime Museum. Race proceeds benefit CYRG and CBMM, where race participants will be greeted along CBMM’s Fogg’s Cove and the winners announced at a trophy reception later in the day. At 9:30 a.m., CBMM will offer a two-hour spectator cruise aboard its 1920 buyboat Winnie Estelle, with limited boarding and advanced registration at bit.ly/watchelf. 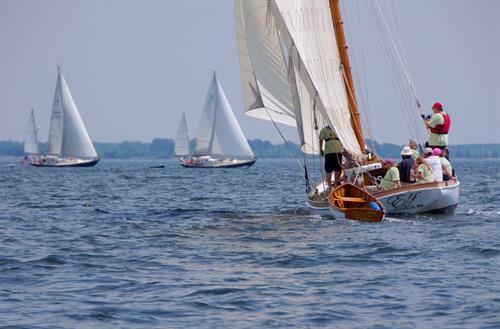 Organized by CYRG, the race features America’s oldest active racing yacht, the 1888 Elf. Restored to historically accurate condition and re-launched in 2008, Elf is a Lawley-built 30-foot class cutter. Elf pioneered offshore yacht cruising in 1893 by being the first small craft to race round-trip from Marblehead, Mass. to Halifax, N.S. To see a documentary and race footage of the Elf Classic, go to bit.ly/ElfClassic. For registration information, contact CYRG’s Rick Carrion at cyrg.elf@gmail.com or 443-566-2212. The racing fleet is limited, with early registration recommended, giving preference to wooden, classic, and traditional yachts. CYRG is a non-profit, member organization dedicated to the preservation of maritime heritage through the maintenance and operation of Elf. She was designed by George Lawley & Sons of South Boston, Mass., and built in 1888 for William H. Wilkinson. Over the warmer months, she can be seen dockside at CBMM, and under sail along the Miles River and Chesapeake Bay. Established in 1965, the Chesapeake Bay Maritime Museum is a world-class maritime museum dedicated to preserving and exploring the history, environment and people of the entire Chesapeake Bay, with the values of relevancy, authenticity, and stewardship guiding its mission. Serving more than 70,000 guests each year, CBMM’s campus includes a floating fleet of historic boats and 12 exhibition buildings and historic structures. For more information, visit cbmm.org.